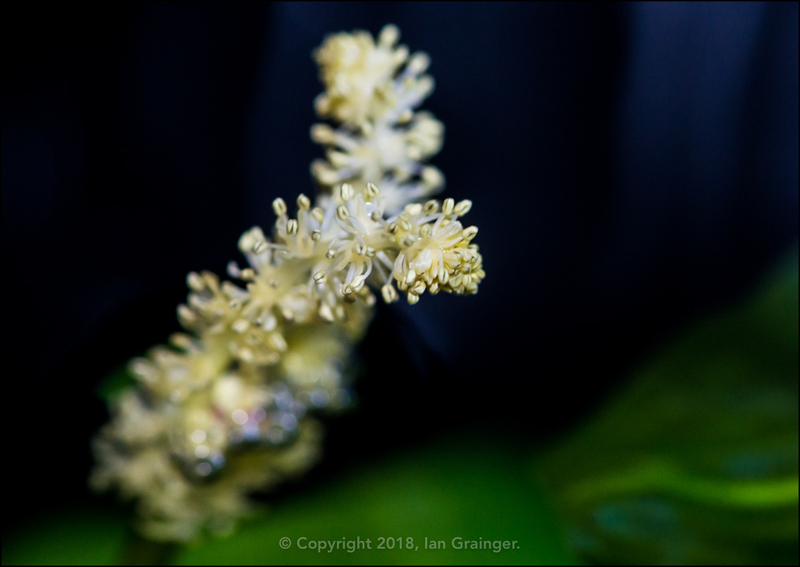 It had been a foggy start to the day of my photo shoot this week, but thankfully the sun broke through and turned the fog into little glistening gems that covered every surface, which I couldn't wait to photograph. 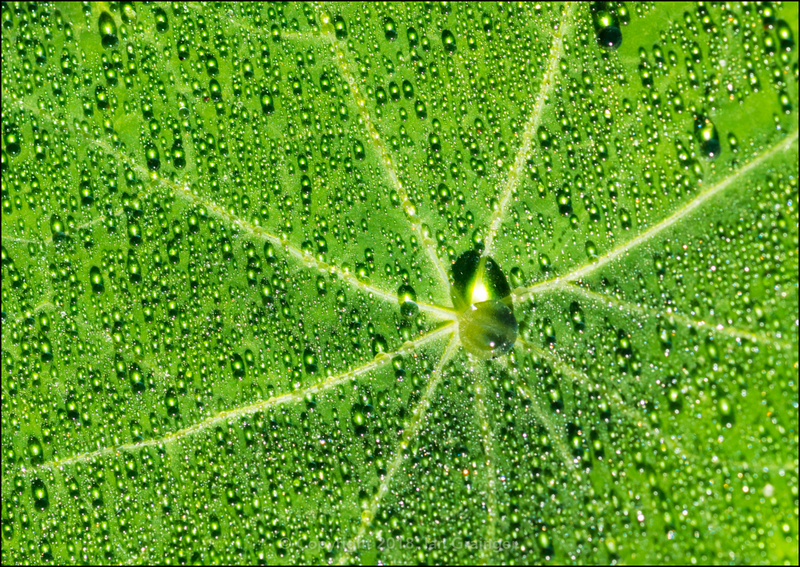 This Nasturtium (Tropaeolum) leaf was probably the most photogenic thing in the garden, and I took plenty of shots of the dewdrops shining on its surface. 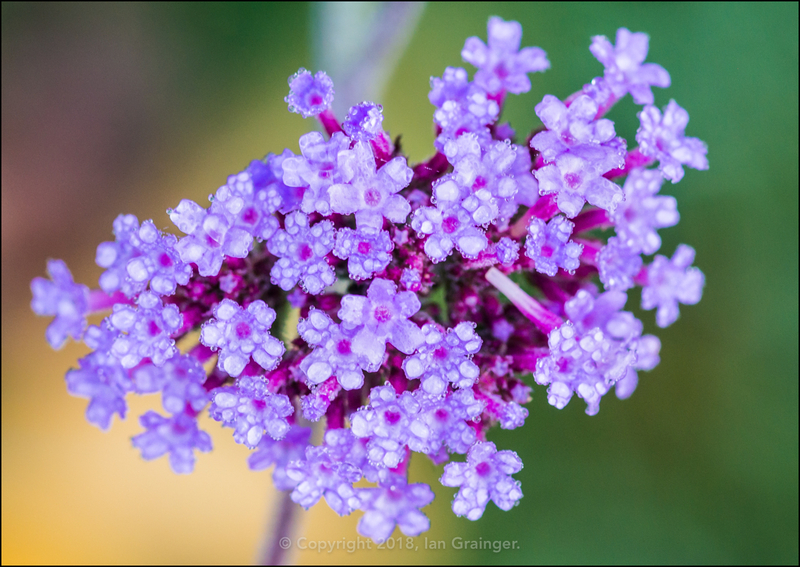 ...and how they seemed to form some sort of orderly pattern as they arranged themselves atop each individual petal of this Verbena (Verbena bonariensis) flower head. 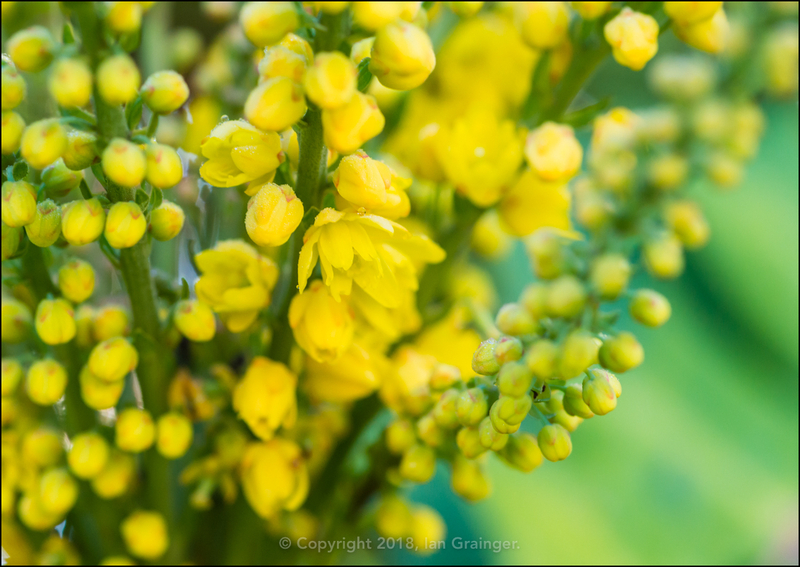 The Mahonia japonica flower buds weren't quite so effective at catching the water droplets, but a few had retained their wet companions. 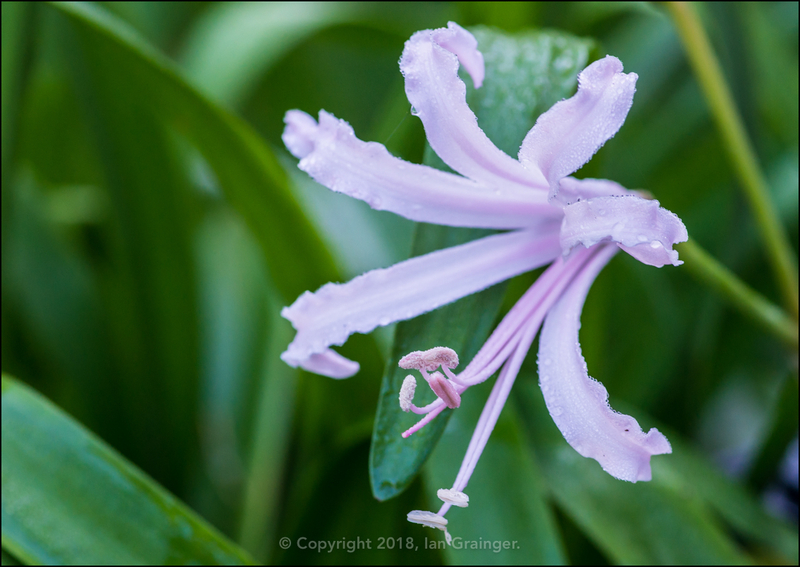 Another new Nerine (Nerine bowdenii) bloom had appeared, this one being a little whiter than the darker pink ones that were already beginning to fade a little. 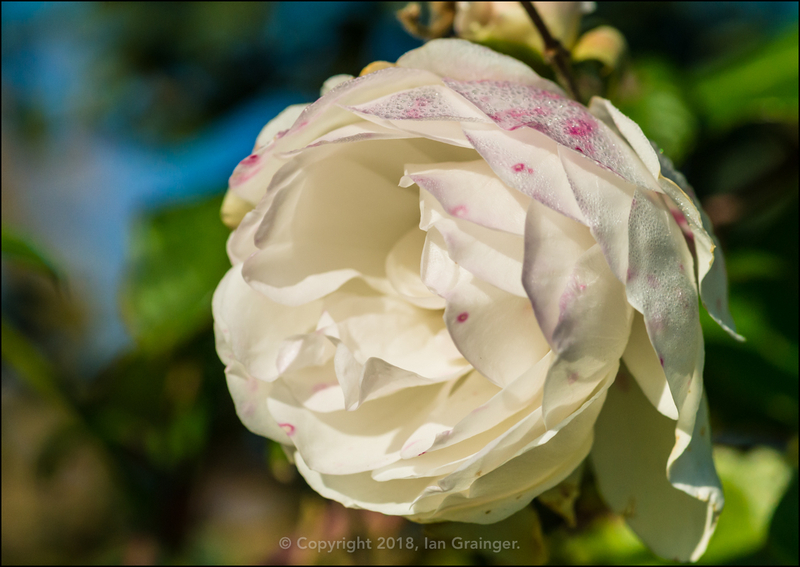 The white Rose (Rosa) that first appeared in June was back, and was looking just as lovely as it had the first time around. 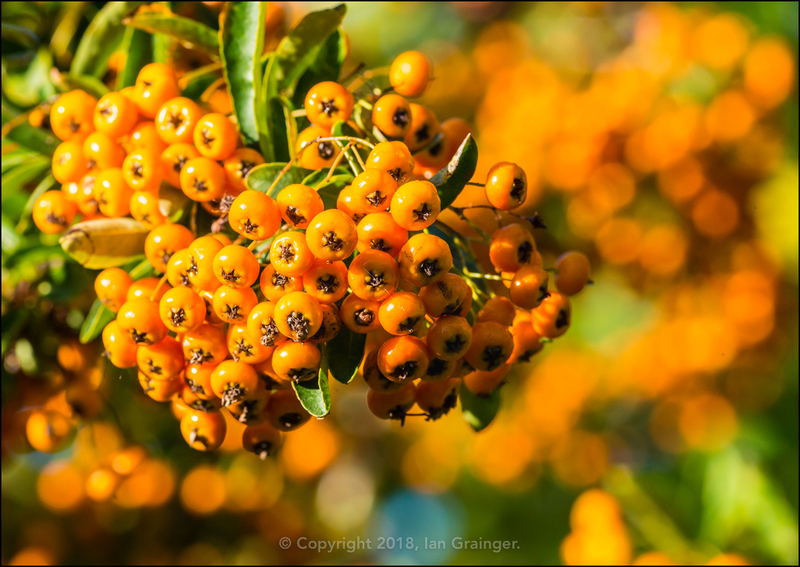 Every week the Firethorn (Pyracantha) bush berries were looking better and better. I really enjoyed the berry bokeh in this shot. 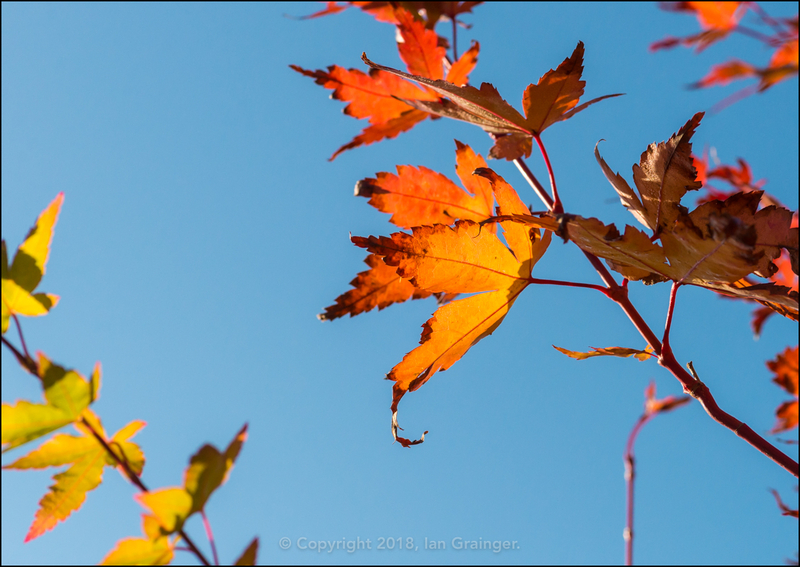 The Acer palmatum leaves were now almost completely brown or golden. It was amazing how quickly they had turned in only a few weeks. 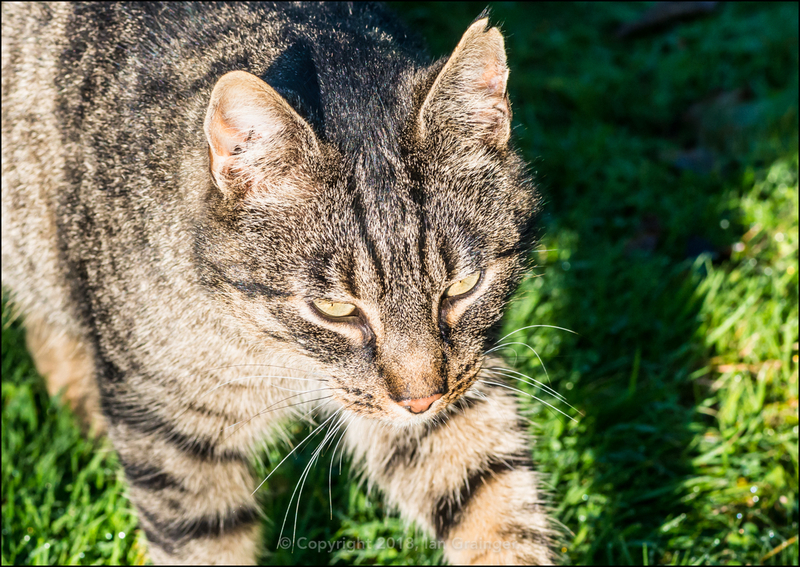 I had my furry photo companion to guide me around dad's garden this week, although he was being more of a hindrance than a help, as he weaved his way between my legs, determined, and almost succeeding in tripping me up! I felt I had to share this! It's a shot of my smallest aquarium, a Fluval 57l. 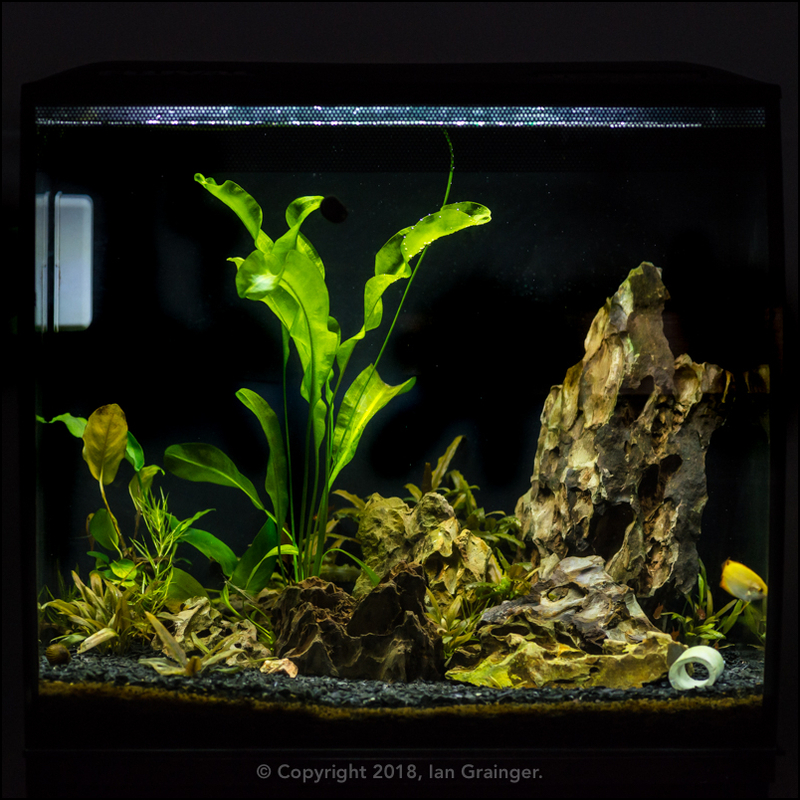 I had planned for it to be full of greenery, with plants such as Cryptocorynes, Anubius, Amazon Swords (Echinodorus), Dwarf Hairgrass (Eleocharis parvula) and Monte Carlo Grass (Micranthemum). In fact all of these plant species have been in this tank at some point. However, the fish don't seem to agree with my decorating choices, and keep digging them up! I have had one success though. 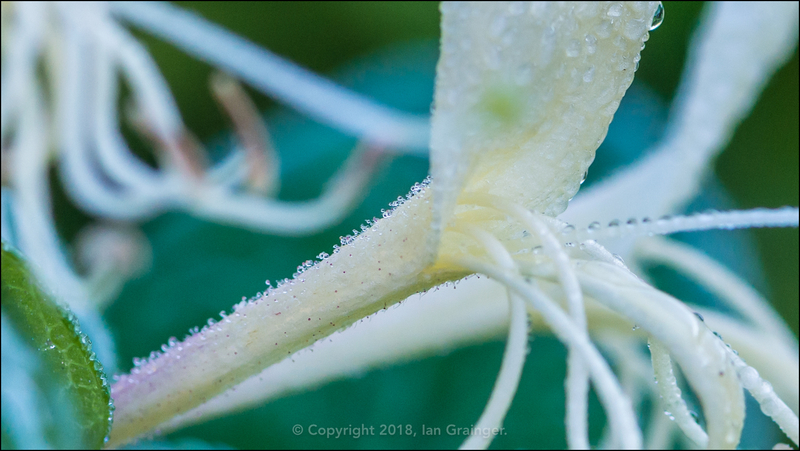 That rather large plant in the middle of the tank is an Aponogeton ulvaceus, and the thin spindly thing making its way to the water surface is actually a flower stem! And look what has appeared above the water surface. My first ever flower obtained from an aquatic plant! 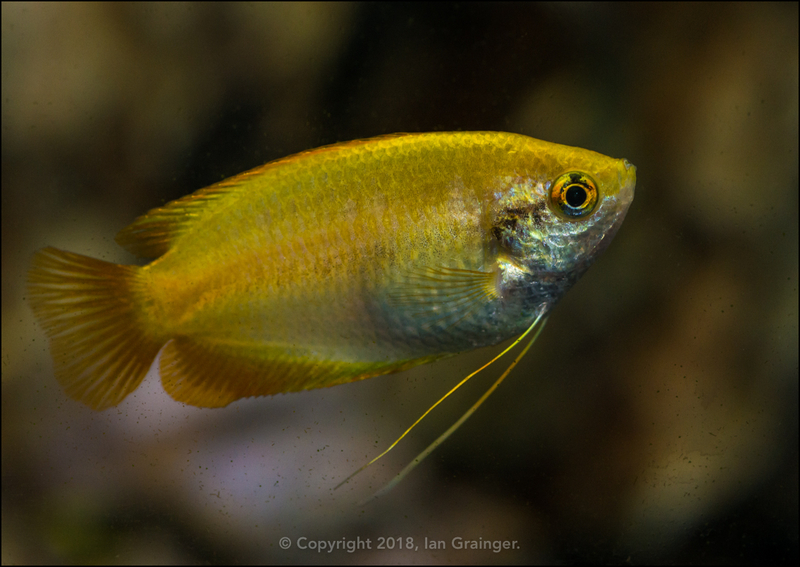 For what it's worth, this Gold Honey Gourami (Colisa chuna) is one of the inhabitants of the tank that keeps destroying my aquascape.